One of the main things people have criticised about Ossus (beside the bugs) has been its gear grind. To me this has honestly been somewhat surprising, because I have to admit that I've been quite excited to be gaining gear the old-fashioned way again (as in by getting it as a reward for specific tasks) for the first time in years. After the overwhelmingly negative response people had to my post about Galactic Command being in a decent state now, I would have expected more players to agree! I guess most of the unhappiness stems from one of two things: First off, for all of Galactic Command's flaws, people have got very used to being able to gain gear from absolutely anything, so the thought of "having" to do something they don't like that much to earn rewards (such as a round of dailies) rankles for some. The other complaint is about the process taking too long/being too grindy, which I guess is just one of those matters of opinion. A lot of MMO players these days seem to think that everyone should be able to acquire best-in-slot gear quickly and easily, else the game is "gating" things or being unfair. They're not technically wrong, but to me getting more rewards if you are able to put more time in is one of an MMORPG's core features, so to me complaining about that just makes no sense. If anything the main thing I would criticise about Ossus' gearing system is that it adds another complication on top of an already incredibly complicated system. It's hard to fathom at this point that the introduction of Galactic Command was originally intended to simplify gearing. Even as someone who's neck-deep into the game and plays it nearly every day I still sometimes run to the wrong vendor, what with how many different currencies and trade-ins there are now. I'm convinced that one of Bioware's biggest challenges for 6.0 will be to completely revamp the gearing system to go back to something simpler without completely losing the benefits of Galactic Command as it is now. That said, I also find what Bioware has done with 252 and 258 gear quite fascinating. It feels very much like an experiment in gauging the players' preferences for gear acquisition. Basically there are currently four roads to 252 gear for people not raiding Gods from the Machine master mode, and to then upgrade it to 258 gear, for which you need to already have 252 and the new currency, masterwork data crystals or MDCs for short. 1. Dailies / weeklies: This is the only way to directly acquire a piece of gear - all the other options only reward one MDC each, and you need more than one for each piece of 252 gear you want to buy directly from the vendor. It's usually also the quickest and easiest option, as all you need to do is complete the weekly mission to do ten dailies. 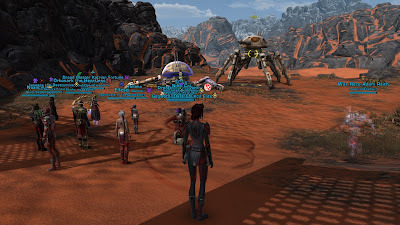 Unlike on Iokath, the dailies are also back to not being on a rotation, so this can be done in a single day if desired, like in the older daily areas. There is one catch however: You cannot choose the exact piece of gear that you will receive. You get to choose among three different boxes that are assigned to different gear slots (for example there's one that will contain a main hand, off-hand, head or ear item) but which piece of gear exactly it contains is random. I suppose this could feel infuriating (especially with the box that contains relics, chances of getting something rubbish are fairly high), but knowing in the back of your head that you can always buy that last missing piece from the vendor instead if you really want to makes it seem not so bad. Instead its feels more like a bonus that you have a chance to get a piece of gear outright instead of having to buy them all from the vendor. 2. Killing the two Ossus world bosses or earning 50 ranked PvP points: For me it's pretty much a no-brainer that the former is the superior way of completing this quest to earn one MDC a week, due to being faster and more fun, but I guess they felt the need to acknowledge dedicated PvPers here. While getting those ranked points undoubtedly takes longer, if you're already playing ranked anyway you'll basically get the quest done "automatically" as you go along. I wonder what the distribution of people taking option one vs. option two looks like. Either way this is also the option closest to the traditional model of rewarding players for participating in a group-centric endgame, even if both world bosses are easily puggable. 3. Trading unassembled components: There is a smuggler in both the Republic and Imperial bases that will trade 500 unassembled components, Galactic Command's more important currency that can only be acquired through PvP, GSF, killing MM bosses or disintegrating loot, for one MDC every week. If you have components to spare, you can also buy a second MDC for double the price (1000 components), but that's the weekly maximum. I started off by buying two per character every week but soon found that this caused me to burn through my stacks of components too quickly and had to stop. Still, I find it fascinating that the option even exists, because this is basically Bioware offering you a way to completely bypass Ossus' endgame content and just upgrade your gear by doing more of what you're already doing. Keep earning those Galactic Command levels and eventually you'll be able to buy the gear without doing all the stuff on Ossus. 4. Time-limited missions: Finally, there is a single quest in the base that changes every week and that, depending on the week, will reward you a single MDC for performing a certain task in PvE or PvP. I haven't seen all the options yet at the time of writing this, but from what I understand the focus can be on warzones, master mode flashpoints, GSF or story mode operations. This feels like an experimental extension of the daily activity bonus for Galactic Command, which keeps the idea of rewarding you for doing old content but tries to nudge people into doing specific kinds of content every week instead of just doing the same thing every day. Unfortunately there's been a number of issues with this. First off, it's not been clear whether it's supposed to be randomised or not. So far, the current "rotation" has been two weeks of warzones, two weeks of flashpoints and two weeks of GSF, which feels too rigid to be random but also awkward if it was set this way intentionally as it really doesn't give you as much variety as it could. Secondly, there's been a huge discrepancy in the effort required to complete the quest. The PvP version was just to earn eight medals in a warzone, which was a matter of maybe fifteen minutes. Then flashpoint week rolled around and we were asked to run four master mode flashpoints to complete the mission, something that takes anywhere from two to four hours! And people complain about PvP supposedly getting the short end of the stick... Then GSF week rolled around and the mission to win three matches was just outright bugged and literally impossible to complete as you simply don't get credit for your wins. It's just been a mess. Those issues aside though, I really like this system of people being given different options to earn their rewards. It's a bit more rigid than Galactic Command as you can't just do anything at any time, but there is still a fair amount of choice. Also, you get rewarded more for participating in more parts of the game, which is how MMORPGs should work in my opinion - if you only ever want to do a single thing (such as PvP) there are plenty of other genres out there that will cater to your tastes in a much better way. For me personally, it's also been great to have some more specific goals to work towards again beyond gaining Command levels, and having a reason to do the new content over the old at least for a while. I'm all in favour of keeping old content relevant, but before Ossus I hadn't realised just how difficult Galactic Command had made it to incentivise running new content. The other day my pet tank surprised me by telling me that he never even maxed out the Iokath-based reputation, but in hindsight it makes perfect sense - practical issues with the dailies aside, there was no reason to do them unless you were after any of the handful of cosmetic rewards. If you just wanted Command XP, pretty much any of the older content was easier and more rewarding. I suppose there is a risk of burnout from doing the same thing over and over, and I'm certainly starting to feel the pressure now that I've got five characters caught up to Ossus. Doing the weekly on all five, doing the world bosses on all five etc. takes a lot of time - not to mention that I've got a couple of guildies who've been doing the whole rotation on a dozen or more characters! However, in the end that is just a problem of our own making. The new gear isn't really required for anything but Gods from the Machine MM (in which case the raid provides you with an additional avenue for gear acquisition anyway), and nobody is whipping our backs to make us upgrade the gear of all of our alts in the shortest time possible. It's just something to while the time away while we wait for 6.0, which is probably still many months away. Although I can't compare it to the ealier daily areas, it seems well constructed and varied enough to stay enjoyable for a while. That said I only have the one character there so far, so it's more a one or two session a week thing for me rather than a very regular activity. I do like the daily area in Ossus. I just wont run over and over again (except for my 1 rep and 1 imp mains) to get gear which atm has little to no meaning for me as I'm never gonna run MM Gods. My 248 on almost all my alts is fine for me. 1 thing though. My guildies are gearing up and now sm ops is so easy there isn't much fun at all, it was always quite easy but now it just goes with no challenge at all. Dps is so fast its crazy. Apart from this I do like the update. I accidentally got in an Story Mode Operation Run via Groupfinder with "the" top guild on our server. They do NiM Sale Runs and stuff like that. The time-limited mission for the MDC is this week "do a gf-ops". All are geared with almost BiS, except one, maybe two pieces. Boy...what a run. The guys were already insane with 248s, but this kind of gear-rating in Story Mode is just overkill. It felt like one of the story-flahspoints, with seven of the god-bots. It may not be official, but I think it's obvious that we're currently in a prolonged "end of expansion" phase, where we're allowed to overpower old content to get those final rewards / achievements that we're still missing. It's certainly fun to try and run story mode operations with overpowered characters in unconventional group setups! It does mean that things are likely going to feel painful when the next gear reset comes aorund though. I oscillate in my approach to the new gear. One week I'll try and do all the weeklies on in amy toons, then the next week or two I'll be so annoyed by the RNG, the incompatible set bonus and the slot bounds enhancements that I won't even bother trading in unassembeled components. ATM I'm collecting the MDC's and not yet actually trading in for any gear as well. It's not exactly efficient, but then I don't do MM raids or ranked PVP, so it's not like I need the gear anyway. Oh yea I forgot about the incompatible set bonus. Oh dear thats another reason not to gear up. This REALLY needs changing. Hopefully one of you guys can explain why the set bonus on the new gear is as it is because I cant work it out. They said it’s a bug and they plan to fix in the next patch in February. Agree it’s super annoying. I'm the same in terms of being a bit hot and cold when it comes to the weekly missions. The first time the 4 master mode flashpoints quest came up I did it on 4 characters... just to feel properly burnt out by the end of the week, and when I saw that they asked me to do the same thing again the week after I just said "screw it", lol. And yeah, I accidentally broke my 6-set bonus on my main before I realised the issue with the set bonuses. On my alts I've now been earning gear pieces but not equipping them because I feel I should wait until I have enough of them to have the same set bonus on the new gear! It feels weird but it's not as if I'm in a rush. I'm also just saving up my MDCs right now to see which pieces I get from the dailies and upgrade those to 258. I just realised, that it is the first time since introduction of Galactic Command, that non-sub players are able to get the highest rated gear. Before now, you had to sub, to get the 248s out of Command Crates or via Components.